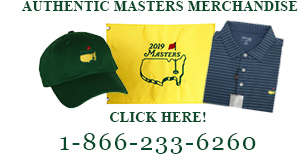 2019 Masters Tournament Merchandise � In Stock Now! 2019 Masters Hats, Shirts, Masters Ball Markers, Logo Golf Balls, and More! Authentic Masters Merchandise with Free Shipping on all domestic orders. Augusta National only sells their Masters golf merchandise for 7 days each year. Once our limited supply is sold, more will not be available until the following April. Great Golf Memories is not affiliated with Augusta National or the Masters Golf Tournament. All Masters Tournament products are authentic and are purchased at the tournament. Masters and Augusta National are trademark properties of Augusta National Inc.